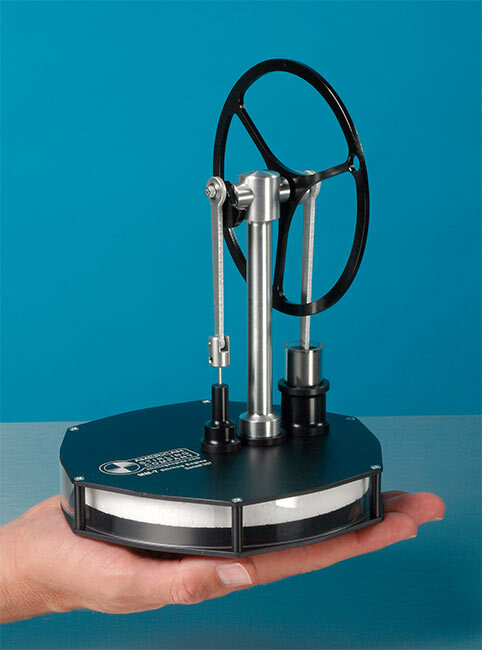 This Stirling engine is a beautiful conversation piece for your home or office, or a great physics or chemistry demo for your classroom or lab. It will run indefinitely on your warm hands in a 72°F (23°C) room, or on a computer monitor, TV, DVD player, VCR, stereo amplifier/receiver or fax machine. It will even run on bright sunlight shining through your window. While the MM-7 operates based on well understood physics, it may be the closest thing to magic and a perpetual motion machine you can buy anywhere at any price. It only requires that the base plate be 7.2°F (4°C) warmer or cooler than the top plate for it to run continuously. Amaze your friends, your family, your co-workers, or just yourself! The MM-7 is a great unique present for that special friend, relative, business associate, or client who already has all the usual worldly possessions. You can be confident that he or she will not have an MM-7. New Laser Engraving: MM-7’s now have a laser engraved serial number and logo. Temperature differential required: 7.2°F (4°C). Power Cylinder Material: Borosilicate Glass. Flywheel Material: Powder Coated Steel. Metal Parts: Anodized Aluminum and Steel. Rotational Speed: Approximately 90 rpm (speed depends on temperature differential, barometric pressure, and other factors) When running on your warm hand, the engine will run faster in cold rooms, slower in warm rooms, and not at all in very hot rooms. None. Internal components are sealed for countless hours of maintenance-free operation. You can safely place this engine on a low-temperature heat source and let it run for weeks, months or perhaps even years. Make sure to protect the engine from continuous exposure to sunshine or the anodizing will fade. Warranty: One-year parts and labor. This is such an elegant engine that you may want to display it on your desk. One of our customers recommended buying an 8″x12″ glass dome. This site sells glass domes. A very fascinating little engine! Your beautiful engine has found a place in my heart. Works on a difference of 3° Celsius!